There are some really alarming statistics on home break-ins that I think every property owner should take the time to read. This information will give you an idea of just how crafty burglars and crooks can be. Not to sound dramatic, but it is about time burglars met their match. One of the best ways for property owners to accomplish this is by honing their physical security measures. A comprehensive and robust system of physical security measures helps keep homes and offices secure, even when there is no one around to monitor them. Burglar proof doors and locks are a huge part of this system of physical security measures, but not everyone takes advantage of them. In most homes and offices, your doors and door locks are the main focal point of a burglars attacks. Once these are successfully bypassed, burglars have easy access to your valuables and resources. Learning more about how to burglar proof doors and locks will aid you in stopping burglars in their tracks. Brute Force Attacks – Brute force attacks are a go-to tactic for most burglars. As such, burglar proof doors are built to withstand excessive force. In most instances, burglars resort to kicking and ramming doors. In relying on brute force attacks, a burglar hopes to overwhelm the structural integrity of your door. A burglar cannot kick a door down if they can’t find your doors weak points or if those weak points have been duly fortified. The door’s weak points usually depend on the material the door is made of, the location of its hinges and the type of locking mechanism that is holding it in place. Brute force attacks are much louder than other covert access methods, but this doesn’t mean that burglars shy away from using this method. If a kicking or ramming attack is successful, it usually saves burglars time which they then maximize by spending more time in your home or office. Drill Attacks – Drilling attacks are similar to brute force attacks, but with a rather specific focus. I say similar because drilling is also a destructive entry method that lacks subtlety. A drilling attack is often aimed at the core of a lock cylinder. The danger of drill attacks is not necessarily the ease of access that it grants burglars. Instead, it is the fact that the main tool for carrying out these attacks can be acquired at your local hardware store down the street. Drilling a lock will effectively damage the lock and render it inoperable. Ideally, a burglar proof door should have steps in place that minimize the success of a drilling attack on your burglar proof doors. Lock Picking Attacks – Unlike drilling attacks and other brute force attacks, lock picking attacks require much more finesse. This finesse usually implies that the lock picking method takes longer to carry out, which is often why most burglars opt not to do it. Lock picking requires skill, attention, and patience, which are some of the traits that make it a great hobby. However, because some burglars shy away from lock picking doesn’t mean that your burglar proof doors shouldn’t take lock picking into account. Your door locks are an essential part of finding the best ways to secure a door against burglars. Locking picking attacks aim to manipulate the pins in your lock cylinder in a way that allows the lock to be opened without its corresponding key. Lock picking attacks are usually hard to spot unless you have the eyes and skillset of a trained forensic locksmith. Burglar proof doors should be equipped with door lock mechanisms that make lock picking attacks increasingly difficult to accomplish in a short amount of time. Lock Bumping Attacks – Lock bumping was originally intended as an efficient way for locksmiths to help people that were stranded in house lockouts or commercial office lockouts. However, no good deed goes unpunished. Now, when people hear lock bumping they are often trying to learn more about some of the security measures to prevent lock bumping. Lock bumping is a popular attack method among burglars. It makes use of specially modified keys to exploit some inherent vulnerabilities in most pin tumbler locks. Lock bumping attacks often depend on the access that a burglar has to specific key profiles. Unfortunately, most of these key profiles are fairly easy to come by. Burglar proof doors should focus on measures that render their locks bump proof or bump resistant. Burglar proof doors should focus on measures that render their locks bump proof or bump resistant. This will help negate the possibility of a burglar bumping your door lock. Luckily for most homeowners and property managers, bump keys don’t work on cars, which means there is one less thing to worry about. Lock Snapping Attacks – Lock snapping is not something that many Americans will be familiar with, but it is a lock attack that burglars use quite often in the UK and other foreign territories. Euro cylinder locks are the locks most affected by these kinds of attacks. Most euro cylinder locks have a flaw in their construction that allows the lock to be ‘snapped’ in order to expose the revolving cam and the core locking mechanism. The first thing you need to know is that there is no universal solution to burglar proof doors. Instead, utilizing a combination of solutions that are geared towards keeping burglars at bay is the best way to burglar proof doors. Burglar proofing your doors is meant to deter the ease of access that burglars have to your home. Ideally, it should stop most burglars in their tracks, but I know that we do not live in a world where every ‘t’ is crossed and every ‘i’ is dotted. Thus, if your burglar proof doors are not able to completely stop burglars, they should ideally slow them down enough to the point where they are forced to give up on breaking into your home or office. One of the most integral assets that a burglar has is time, and it is also one of their biggest adversaries. 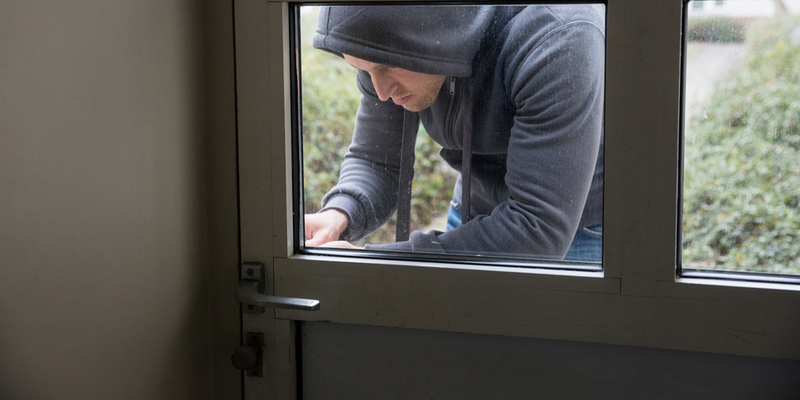 On average, 220 burglaries occur every hour and this number is bound to continue increasing if property owners do not invest in burglar proof doors. The door material refers to the primary component of any door. A wide range of materials are used in modern doors, but not all of them are well suited as burglar proof doors. A burglar proof door should be strong enough to offer up resistance to brute force attacks. Some of the best materials to construct burglar proof doors are steel, solid core wood and fiberglass. Steel doors and fiberglass doors are commonly used for exterior purposes, whereas wood can be used for both exterior and interior doors. Choosing the right material for your door is a crucial process. I often say that locks are the cornerstone for most physical security measures in the home or office. However, doors are the cornerstone for crafting burglar proof doors and locks. A high-end security lock that cannot be picked, like the HYT chain key, will mean very little if it is placed on an exterior laminate door. The door that you choose should ideally be a solid core door that cannot easily be kicked in or rammed through. Also, if it is being used for exterior purposes, the door should hold up well against weather elements. Homeowners or property manager’s that make use of stave-core doors or hollow wood doors will not be well equipped to stand against brute force attacks that burglars will employ. Also, try to stay away from doors that feature numerous glass panels. Solid core doors should be used on all exterior doors. Choose a material that is able to withstand harsh climate and temperate conditions. A weak door can easily be overcome by brute force attacks like ramming or kicking. If the door has any glass panels, reinforce them with security glass film to prevent burglars from breaking in through by means of the glass panels. Burglar proof doors work hand in hand with the door frame that complements your door. The door frame is what the door is fitted into. Not only does this help keep the door in place, but it also provides an extra layer of security. The material and construction of the door frame are just as important as the material of the door. If the door frame is not properly constructed, doors can easily be kicked in with little to no resistance. The various parts of the door frame come together to offer up a great deal of resistance in burglar proof doors. A functioning door frame should include a door jamb, a door head, a door stop. These elements come together to actively hold your door in place. Burglar proof doors have to focus on each of these elements in order to prevent burglaries. The door jamb is the part of the door frame on which the door itself is hung. One side of the door jamb caters to the door hinges, while the other side caters to the lock cylinder and its corresponding strike plate. The door stop is often comprised of thin wood strips that are affixed to the door jamb and meant to reduce the possibility of the door being taken off its hinges. Hinges are often attacked by burglars so having a door stop in place reduces the success rate they have attempting to take a door off its hinges. Reinforce the door jamb with steel placements that add an enhanced layer of security. Utilize door stops in all door frames. The door stop is responsible for preventing the door from being taken off its hinges. Pay close attention to the nature of your hinges. Burglars often attack hinges in order to compromise a door. Doors with inward facing hinges are often much easier to kick in. It is nearly impossible to burglar proof doors without talking about door locks in any way or form. Doors play a huge role in home security, but a large part of that burden also falls on door locks. Choosing the right door lock to complement your doors is the key to ending up with burglar proof doors. A door lock that is meant for burglar proof doors should be able to stand against brute force attacks, drilling attacks, lock picking attacks and lock bumping attacks among others. For most burglar proof doors in residential properties, the go-to lock is often a deadbolt lock. Deadbolts are effective at keeping your home secure, and they can withstand a great deal of force. However, the key is not just selecting any deadbolt, but selecting the right one. It is always advisable to use a Grade 1 deadbolt on your exterior doors. Commercial properties are prone to using commercial grade deadbolts or mortise locks that also offer up durability and security. In order to make your door lock more resistant to brute force attacks, longer screws should be used to affix your strike plate into the door jamb. Essentially, once the bolt is thrown into the door jamb, you want to make it more difficult for the strike plate, the lock bolt and the door frame to overcome by kicking or ramming attacks. Furthermore, choosing locks that have anti-drill, anti-pick, anti-bump and anti-snap features will drastically reduce the possibility of a burglar compromising your lock. It is unlikely that most homeowners or office managers will already have these locks installed. If this is the case, there are several options at your disposal. The first, and most streamlined process is to contact a residential locksmith or a commercial locksmith to help you change the locks on your door. 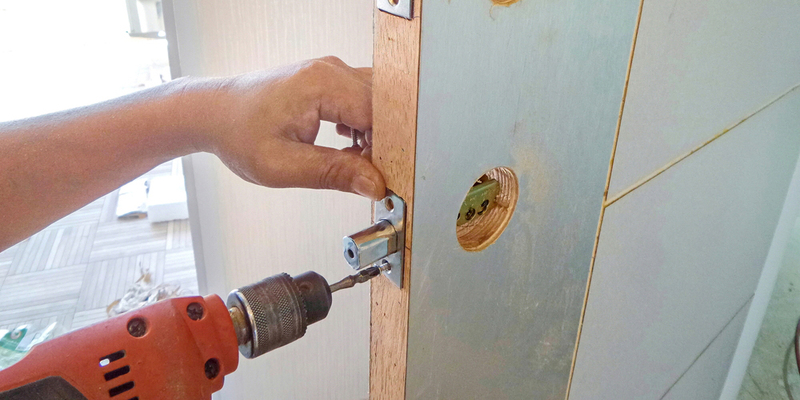 In lieu of this, more DIY- savvy homeowners can carry out DIY security upgrades that center around adding anti-drill pins and additional security pins to their lock cylinders. Another option that homeowners and business owners have is to invest in keyless entry locks that do not have traditional key ways. These locks will not have the vulnerabilities of traditional locks, but this does not always mean they are a more secure option. Some of these keyless entry options are not built with the same materials as traditional locks, which allows them to be easily overcome by brute force attacks. Always choose burglar proof door locks to be used in conjunction with burglar proof doors. Deadbolts are the best choice of locks to pair with residential burglar proof doors. In commercial settings deadbolt locks or mortise locks can be used for security purposes. Reinforcing the strike plate makes your lock more resistant to brute force attacks. This can be done by using longer screws to affix the strike plate to the door jamb. Burglar proof doors do not only depend on the material of the door and its corresponding door locks. There are many additional parts that can be used to keep your homes and offices more secure. Surveillance cameras, door security screens, theft proof hinges, motion sensor alarms and monitored alarms are all examples of some of the additional parts that come together to help make doors more secure against burglars. The positioning and placement of each of these additional security items will influence the way your doors hold up to the attacks of burglars. Understanding the ways each of these parts can complement each other and coexist is the best way to have a true burglar proof door. Placing cameras at vantage points and motion sensor alarms along the trajectory of the door frame are some of the simple ways additional security parts can be used in conjunction with burglar proof doors. Burglar proof doors are not stand alone mechanisms. Pairing burglar proof doors with additional security measures like surveillance cameras and monitored security systems helps make them more effective as a burglar deterrent. Properly positioning your additional security components will influence the scope of security that they are capable of providing. Each of these elements should be used in close proximity to your door to achieve the best results. Prime focus should be placed on the material of your door. Exterior doors should always use solid core materials that are much harder to kick down. Solid core wooden doors, steel doors, and fiberglass doors are great options for burglar proof doors. If your exterior door has individual glass panes, use security glass film to reinforce these panes. This will make it difficult for burglars to break the glass panes and gain access to your home. The door frame should be properly constructed and feature a door jamb and door stops to enhance the additional resistance that they offer. Reinforcing the door jamb with galvanized steel is one of the best ways to increase its overall strength. Door hinges need to be reinforced as well. For most residential properties, the doors open inwards, which means that the door hinges are not exposed. However, use longer screws to secure your door hinges. Ideally, the screws should go through the door jamb and into the wood stud. This will make it harder for the doors to be kicked in or rammed successfully. Commercial properties often feature doors that open outwards, which means that the door hinges are exposed. To prevent burglars from taking advantage of the exposed hinges, employ theft proof hinges. Some examples of these hinges include hinges with crimped pins, hinges with safety studs and hinges with set screws threaded through. Pair your burglar proof doors with burglar proof locks. The door is only as strong as the elements that surround it, so if your locks are a weak link, your door will easily be overpowered. Burglar proof locks should have anti-drill, anti-pick, anti-bump or anti-snap locks. Utilize deadbolt locks on all exterior residential doors and also on commercial entry doors. High-security mortise locks are good options for commercial settings as well. Contact a locksmith to change your locks to burglar proof locks, or retrofit them to include anti-drill pins and additional security pins. Reinforce the door locks strike plate, similar to the way you would reinforce the door hinges. Using longer screws will affix the strike plate to the wall studs and increase its resistance. Sliding doors should always be reinforced with additional locking methods. Blocking the tracks of sliding doors and reinforcing the glass with security film is a common way to burglar proof sliding doors. Invest in surveillance cameras that are used to monitor your exterior doors and entry door ways. They serve as additional parts that help you document the activities of any burglar attempting to break into your home or office. Install window locks on any windows that are in close proximity to your entry doors. Residential locksmiths can assist with window lock repair or replacement. Security screens and door security bars are beneficial auxiliary products that can be paired with burglar proof doors to increase their overall strength. Burglar proof doors require a lot of attention, and they are only as strong as the weakest link that surrounds them. The key to obtaining true burglar proof doors is to systematically increase the strength of your doors and the components that they work with. I hope that the methods and processes above will help you get a head start on burglar proofing your doors. As always, if you have any questions or concerns, do not hesitate to ask.